The FOV calculator lets you plug in lenses and it will show you what it will look like depending on the size of the sensor. The chart has all lenses and sensors ranging from Super 35mm Motion Picture to ¼ inch HD, all HDSLR’s included. This is a really useful tool to help explain FOV and crop sensors. There are people who think one should use Super 35mm when calculating the 35mm equivalent. After all, for video, why should anyone consider a standard photographic sensor size anyway? Angle of view related to different formats is where it gets tricky and we need simple math. The angle of view of the 16mm format lens is about half the angle of view of 35mm format lens. If you want to shoot the same angle, 62 degrees, you’d select a 12mm lens for the 16mm camera and a 24mm lens for your 35mm camera. Super 35 is a very variable size, depending on company and who’s making the groundglass or frame markings. That’s why I will receive emails from Denny Clairmont and Mitch Gross as soon as they read this, because these specs require many footnotes and further explanations. I’ve rounded out the dimenstions to one decimal place for clarity. Since there are so many aspect ratios and dimensions, lens manufacturers use a diagonal measurement (shown at bottom of page) and try to cover the most area they can. If we’re using a 40mm 2/3″ format lens, and want the equivalent 35mm full frame size, here’s the math. New lens comparable angle = (31/11) x 40. That’s because the diagonal of the NEW full 35 film frame is 31mm. The diagonal of the OLD 2/3” CCD is 11mm. The OLD lens is 40mm. For those of us whose math is rusty: 31 divided by 11 is 2.8. Multiply 2.8 by 40 to get 113. 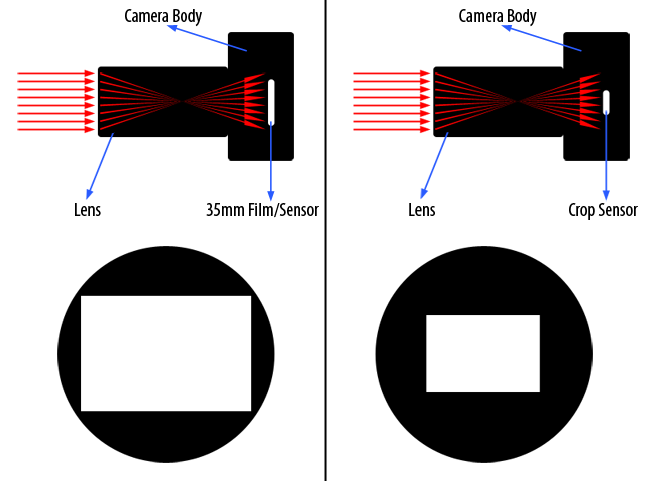 So, the comparable lens angle of the 40mm in 2/3″ format is a 113mm in 35mm format. The size of the sensor will affect the image angle of view, so that a 25mm Prime lens will look different if viewed on a variety of image formats. Thus a 25mm lens will have a mid shot when used on 35mm film (HDTV 1.78:1 16:9 aspect ratio), close up on HD Camcorders and big close up on smaller semi-professional, ‘prosumer’ camcorders such as EX-3 and Z1 etc which have 1/2″ sensors and 1/4″ sensors respectively. This explains therefore why if you mount an HD lens onto a ½? camcorder (such as Sony PDW-F355) without an optically corrected mount, that a wide angle acts like a telephoto and why the focal lengths of wide angle lenses of ½? lenses are always smaller than those used for 2/3″ lenses. Even though lenses are designed to work with different negative and sensor sizes, the convention is that lenses are still referred to by their focal lengths and/or also their zoom ratios in the case of zoom lenses. A very useful trick to know is that to convert 35mm focal lengths to 2/3″, just divide by 2.5 and to convert Super16 to 2/3″, divide by 1.6. Thus a 25mm PL mount film lens has the same field of view as a 10mm 2/3″ lens. The same lens in Super16 has an equivalent focal length of 16mm and has the same field of view as a 10mm 2/3″ lens. This entry was posted on 4 ottobre 2015 at 18:06 and is filed under Cinema e Fotografia with tags arri alexa, Blackmagic Cinema, canon c300, panasonic gh4, red epic, sony f55. You can follow any responses to this entry through the RSS 2.0 feed. You can leave a response, or trackback from your own site.